A federal regulatory agency has concluded that a leaking natural gas line in Cook Inlet poses a risk to public safety and the environment, and says it should be shut down if not repaired by May. In its 11-page notice of a proposed order, the U.S. Pipeline and Hazardous Materials Safety Administration also provides new information about the leak, including that pipeline owner Hilcorp Alaska learned it began in December. The company didn't publicly disclose the leak until Feb. 7, when it said a helicopter overflight detected gas bubbles. A Homer environmental leader, in his own overflight, said it looked more like a "cauldron" and took a video to prove it. The video showed a massive, roiling leak. The federal agency said the company's current inspections of the 8-inch steel pipeline aren't adequate to detect damage, such as from corrosion or gouges by rocks. Hilcorp Alaska didn't respond to requests for comment. The pipeline, built in 1965, delivers gas for fuel from shore for four aging offshore platforms in Cook Inlet. Two of those platforms produce small amounts of oil and two are unmanned with no active production, yet still require electricity for such things as lights for navigational aids. Hilcorp Alaska has 30 days to challenge the proposed safety order, comply with it or work with PHMSA to address the problem, according to the notice issued Friday by Chris Hoidal, director of PHMSA's western region in Lakewood, Colorado. The Alaska Department of Environmental Conservation has also said it wants a plan from Hilcorp. The DEC said Hilcorp needs to explain by Monday, March 13, how the company would shut down the oil wells on the platforms and evacuate gas from the line to control the release, should such a step be required. By Wednesday, the state agency said, Hilcorp should present a monitoring and sampling plan to assess risks to fish, wildlife and the environment, including endangered Cook Inlet beluga whales. The agency could call for the pipeline and platforms to be shut down if an analysis showed the benefits of doing so outweighed the risks, said Geoff Merrell, Central Alaska region manager for DEC.
PHMSA has jurisdiction over the pipe and its operation, and could make its own decision to shut down the pipeline, he said. DEC has jurisdiction over the leaking gas, which the state agency considers a hazardous substance. The PHMSA letter also indicates repairs may not come as early as originally hoped. Hilcorp has said repairs by divers cannot begin until at least mid-March, in part because of a combination of large ice pans and extreme tides that would put personnel and boats in danger. Hoidal, however, says Hilcorp has indicated late March will be the earliest start date. The sea ice is expected to clear sometime between then and the end of April, allowing divers to safely access and fix the leak. "The serviceability of the pipeline will remain impaired until at least this time," Hoidal wrote. Hilcorp appears to be "shooting straight" about its assertion that the Inlet is too dangerous now for divers, said Dan Magone, who has overseen commercial repair dives out of Dutch Harbor for decades. Magone said on Monday that he had not heard of the leak in Cook Inlet, having just returned from three weeks spent removing a beached vessel in Akutan in the Aleutian Islands. But Magone, general manager at Resolve Magone Marine, said diving anyway is dangerous; add large pans of ice moving with the Inlet's strong tides and the danger increases substantially. "If ice was the only hazard, you might figure out a plan, but it's not," said Magone, who has led commercial diving projects in Cook Inlet in the summer but not in winter. "It is a challenging place to work." According to PHMSA's notice, Hilcorp had observed an increase in gas line flow in late January, leading it to launch helicopter "surveillances." The aerial searches led to the discovery of the leak after a helicopter spotted roiling waters on Feb. 7 above a section of the pipe. Later, Hilcorp's analysis of gas flow showed that the line began leaking in "late December," Hoidal said. Hoidal said that Hilcorp's inspections of the pipeline's condition are inadequate. "The annual side-scan sonar or multi-beam echo-sounder survey, or both, that Hilcorp currently performs, do not provide sufficient information to determine whether there are external loads on the pipe, eroded pipe, rock impingements, metal loss, dents, gouges, dielectric coating deterioration, and/or missing 1-inch thick concrete weight coating," he wrote. The leaking portion of the gas line carried oil until it was converted to carry gas in 2005. The leak is located about 3 ½ miles from shore, northwest of Kenai. Initial reports put the leak at 225,000 to 325,000 cubic feet of gas per day, enough to fuel about 390 homes a day in Southcentral Alaska in December, a cold month when gas use was high. 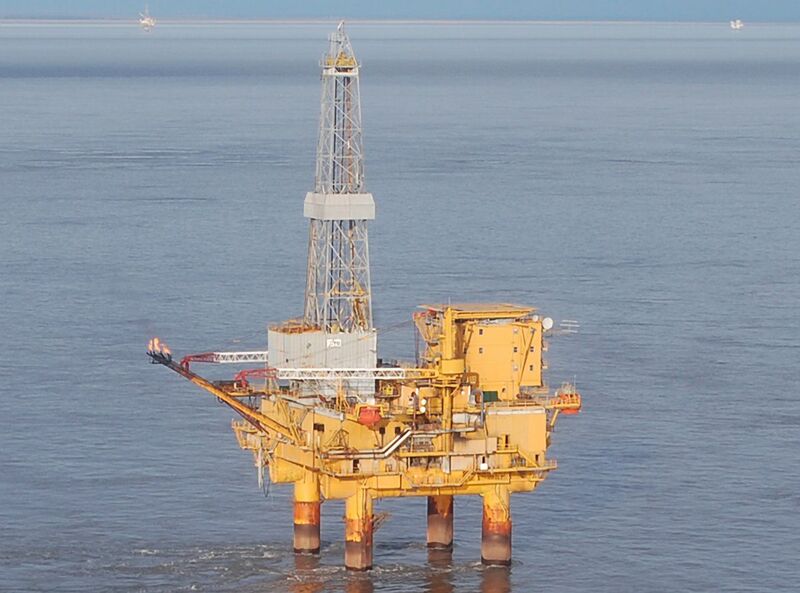 Later, Hilcorp Alaska on Feb. 15 pegged the leak at 210,000 to 310,000 cubic feet a day, after steps were taken to reduce gas flowing through the line by reducing activity on the platforms. PHMSA's letter is based on that lower amount. Hoidal says the federal agency accepts Hilcorp's assertions that "immediate repair" of the leak poses an "extreme risk" to divers and other repair personnel. He says that option is "not viable." The agency also agrees with Hilcorp that the risk of shutting down the gas line includes a crude oil leak. Seawater might enter the pipeline and flush out residual oil. Also, without fuel gas to help power oil production on two of the platforms, a separate pipeline carrying crude oil might freeze, causing a rupture in that line. But Hoidal also lists potential dangers, including a leak that could worsen and increase the threats to wildlife such as beluga whales. The federal notice to Hilcorp says that continued operation without "corrective measures" presents a risk to "public safety, property and the environment." The agency made that decision after accounting for such factors as the pipeline's age, the hazardous material that's leaking, the Inlet's wildlife and the geographical characteristics around the pipeline. The agency notes the same line leaked twice in 2014, in June and August. The leaks were 40 yards apart, about two-thirds of a mile from the current leak, Hoidal said. The previous gas line owner, XTO Energy, found that the leaks were caused by rock abrasion in areas where the pipeline is not continuously supported by the seabed. XTO Energy sold the pipeline and other facilities to Hilcorp Alaska in 2015. Pipelines in the Inlet are threatened by vibrations from turbulent water when they aren't supported by the seabed, allowing them to potentially strike rocks. In calling for permanent repairs to the pipeline by May 1, PHMSA wants a plan from Hilcorp on how it would shut down the pipeline, including purging gas from the line but maintaining enough pressure with a "non-hazardous" substance to prevent saltwater from entering. The agency also calls for long-term steps to improve inspections and make other repairs to the aging line, if needed, after the sea ice has melted. That includes using "high-resolution" sonar or related technology to inspect the line to find sections that aren't supported by the seabed and may be subject to vibration or "excessive bending." Unsupported sections at least 10 feet long must be visually inspected to look for corrosion and damage, the letter said. Lois Epstein, a licensed engineer who served for several years on a federal advisory committee addressing pipeline issues, said it's clear from the proposed order that Hilcorp could have done more to prevent the leak. That attitude won't help the company's effort to get federal permitting approval for a much more remote oil project known as Liberty that it has proposed in the Beaufort Sea, she said. "People are going to remember this," said Epstein, Arctic program director for The Wilderness Society.